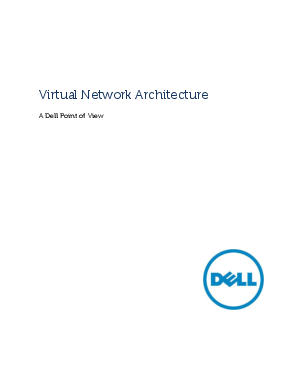 DellTM Virtual Network Architecture (VNA) framework is a direct response to the growing need for networking solutions to be brought into the modern age. VNA is designed to be both innovative and practical, based around a set of open, flexible architectures that provides the benefit of the latest innovations in networking. VNA is also designed to integrate tightly with innovative new network virtualization solutions such as the Hyper-V Network virtualization framework jointly developed by Microsoft® and Dell. This whitepaper outlines the principal elements of VNA and maps out its principal applications for traditional, virtual and cloud IT environments.